My intention was to go for a ride and park at a scenic overview, one that perhaps I had visited before. I pictured what that would be, and imagined what would have had to happen there, in order for me to find what I thought I needed. I had it all figured out. I was at least mildly aggravated that I had gotten off to such a late start. I was mad because it was not as I had planned it. Surely now, I thought, things would not turn out the way they should. I took the route that I usually do when I go on one of my “perspective’ rides…the one’s where I almost always find peace. Would I find it today, I wondered. My hope was to be able to regain some of the inner peace that I have lost in the past eight months. Bryan’s deployment has certainly taken a toll in a number of ways.There has been frequent sadness as well as overwhelming fear and anxiety. Many times these feelings would just well up inside and present themselves. As I look back now, however, I would see all of the most uncomfortable of these episodes as being situations where insights were gained. So today I drove, anxious at first and then little by little a calm feeling filled my awareness. I listened to music, as I often do, and thoughts would be entertained, dilemmas presented and solved, concerns would well up and calm down. I was almost uneasy that my intentions to park and to cry the feelings of the last eight months away would be thwarted by the calmness that was taking hold. Two roads diverged…I would always take the one less traveled and along I went. Eventually I came upon Bull’s Bridge, a place I had visited a couple of times in the past, and almost as if I wasn’t making the decision, pulled into a small dirt parking lot just off the road before the covered bridge. I popped out of the car and walked toward the bridge with the certainty a previously thought out move. Making my way toward the falls, I felt an almost magnetic pull that drew me to the noise of the turbulence, as the water rushed over the rocks. I made my way across the bridge and although there were a number of cars in the small dirt lot, there was no one in sight. Moving slowly toward the falls, I jumped down the incline just above the water. It was a longing I felt inside that took me closer to the water and down the rocks that were the bank of the river on this side. I stood still several times and just looked at the water. The shear force of it captured my attention and I could feel all the thoughts inside my head quiet down as the thunder of the moving water overcame my conscious thought. I walked along the side of the water for a bit hopping from rock to rock seeking, without being conscious of it, a spot to pause and take in the moment. It took a few minutes, but I found that perfect place. I sat. The sound of the water filled my head. I could feel the sensation of a fine mist now on my cheeks. It was so fine that I could feel only a hint of moisture as I brushed my face with my hand. I was aware again of my purpose for todays ride. This was not what I had planned, I though, although it seemed just right. An image of Bryan came into my mind, one that I have had many times in recent memory. It was him standing there in his camouflage uniform. Without even a conscious thought, the tears started to fall. The months of sadness slowly trickled down my cheeks. The roar of the falls was all I could hear. The sheer volume in the flow of the water over the rocks was breathtaking. It was beautiful and powerful and spoke to my soul. The tears continued to fall and the image before me took on meaning…and that voice inside was heard…”Deora De”. 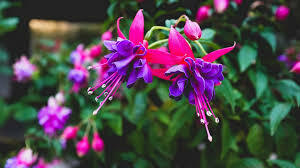 In Ireland there is a plant called fushia that grows at the side of the road. The word Fushia translates in Gaelic to ‘Deora De’ or ‘God’s tears’. When we cry, God cries with us. Images flashed before me of mothers and fathers who have cried for their children, in times of unbearable sorrow as well as in moments of fear and overwhelming sadness. The raging river in front of me represented the accumulation of each tear ever shed by parents and all who have cried for the one’s that they love. The river flowed and all I could do was nod in recognition that so many of us share such moments of sadness. The tears flowed together and were taken away. I sat in silence and the tears fell and the mist hit my face and my tears met with theirs and the tremendous love that we share with our children as well as those we love was realized. We share our individual sadness with each other and with God and it becomes ‘Deora de’ a thunderous force that transforms into a gentle healing…and with it, peace.